You’re probably familiar with the concept of chakras. They’re the energy centers in the body that align with the spine, each one governing various organs or regions of the body. In this post, I’ll give you a good overview of what they are and what they do, but, more than that, I’ll teach you exactly how you can clear your chakras for yourself! How can knowing about the seven chakras help you? Eastern belief systems and philosophies tell us that throughout our bodies there are areas where nerves, veins, and arteries are most dense, where our vital life force is more concentrated. These are chakras. Of these, there are seven major chakras beginning at the base of the spine and running to the crown of the head. In Sanskrit, chakra means wheel, and that’s exactly how these bundles function, as a wheel or disk of energy in the body. Each chakra has its own name and color vibration, and regions of the body that they influence. Our thoughts and emotions impact the chakras and likewise a blockage in one or more chakra can have an impact on how we feel and what we think. In order to cleanse your chakras, you have to know a little bit about them. This chakra relates to where you get your sense of belonging from. Your ability to feel secure, to feel that you can survive and you have a solid foundation to rely on all stem from the energy in this chakra. Located at the base of your spine, when the root chakra is open you feel stable, secure, safe, and fearless. Some of the emotional stressors that block the root chakra include financial stress, worry about food or eating habits, and discord within the family. Its color is red. Learn more about healing the root chakra here. This chakra relates to your relationships and how you respond to others and new experiences. It’s located just below your navel; the sacral chakra is the center of your creativity and sexuality. When it’s open, your creative expression is at its highest and you integrate new experiences easily. You have a strong sense of well-being and pleasure. A major stressor that tends to block this chakra is when we live with a belief in scarcity. Its color is orange. Learn more about healing the sacral chakra here. This chakra relates to your confidence and your sense of control in life. In short, it’s your source of personal power. The solar plexus is the area just under the rib cage and when this chakra is open you have a strong sense of worthiness and self-esteem. The voice of your negative inner critic is this chakras worst enemy. Its color is yellow. Learn more about healing the solar plexus chakra here. This chakra relates to your ability to love. Its physically located in the center of the seven chakras and part of its purpose is to link the more physical lower chakras with the upper three that deal primary with spirit. It is both physical and spiritual and is your source of connection and love. Located just above the heart, when it is open you feel great joy and peace. When you are grieving, depressed, or feeling alone, the heart chakra is likely to be blocked. Its color is green. When the first four chakras are open and flowing, it is much easier to open the last three more fully – thus connecting to your fullest potential. Learn more about healing the heart chakra here. This chakra is connected to your ability to communicate and to listen. Located in the throat area, when this chakra is open you’re able to speak your highest truth and honesty comes easily. If you find that you’re frequently in situations where you can’t speak up for yourself or be honest with yourself or others, the throat chakra is likely being impacted. Its color is blue. Learn more about healing the throat chakra here. This chakra relates to being able to see the big picture and focus. It is the center of your intuitive self. The more you listen to your intuition the more this chakra will open and the more intuitive sensations you’ll receive; a wonderful cycle of flow within your life. Located between the eyebrows, when the third eye chakra is open grace, wisdom, and imagination are all strong with you. Stressors that influence this chakra include feeling stuck and unable to make life decisions, and not trusting yourself. Its color is indigo. Learn more about healing the third eye chakra here. This chakra relates to your connection to spirit, to God. It is the chakra of enlightenment and when fully open your sense of connection to your higher self and the Divine is strong and guides your life effortlessly. It’s located at the very top of your head and stressors that impact the crown chakra include feelings of isolation and not being able to find the good in situations. Its color is violet, almost white. Learn more about healing the crown chakra here. Your chakras open and close regularly. More stable than your moods, but similar affected by events in your daily life. Illness can result when one or more of your chakras remains closed for a prolonged period of time. Chakra work is emotional work. When your thoughts and emotions are habituated toward the negative, your chakras will close and life will not flow as easily. For body/mind/spirit integration and a feeling of wholeness or peace, it’s important to keep energy flowing – in your life and in your body. It’s so important to bring your awareness to your physical body on a regular basis. If you can, spend five minutes a day to do a quick body scan. Where are you feeling pain? What are you feeling emotionally? What have you been thinking about? The answers to these questions will tell you which chakra needs attention. Then, spend time visualizing the affected chakra. You can imagine it as a wheel or disk, spinning smoothly and perfectly in the appropriate area of the body, or as an orb of light brightly glowing within. You can imagine the gunk that’s blocking a chakra spinning out and releasing so that it’s color begins to glow brighter, stronger, and more radiantly than before. Even just two minutes a day will make a big difference in how life moves through you and how you move through life. Have you ever wished you could just kick back, relax, and effortlessly invoke angels to cleanse your chakras and your entire energy body? Experience a powerful Chakra Cleansing and Energy Body Restoration guided by Archangel Metatron. Cleansing your chakras is an ideal way to un-stick your blocked energy and to get it freely flowing. It’s ideal because you can do it yourself, it’s beneficial for your overall system regardless of disease, and it’s incredibly powerful and effective as well. Before we go on, I need to bust a chakra myth: no one has 100% clear open chakras 100% of the time. Our aim is not an unrealistic perfection. Our chakras open and close constantly, largely in response to external stimulus. It’s natural and therefore important not to become fixated on whether or not one or more chakras are closed. The problem comes when we let our environment, thought and emotion patterns, habits, and beliefs muddy our energy system. Holding on to negative feelings, regularly eating bad foods, and constantly judging others are just a few of the ways that our chakra system gets clogged. Chronic clogging then leads to disease. You can see why cleansing your chakras is an important self-healing practice. 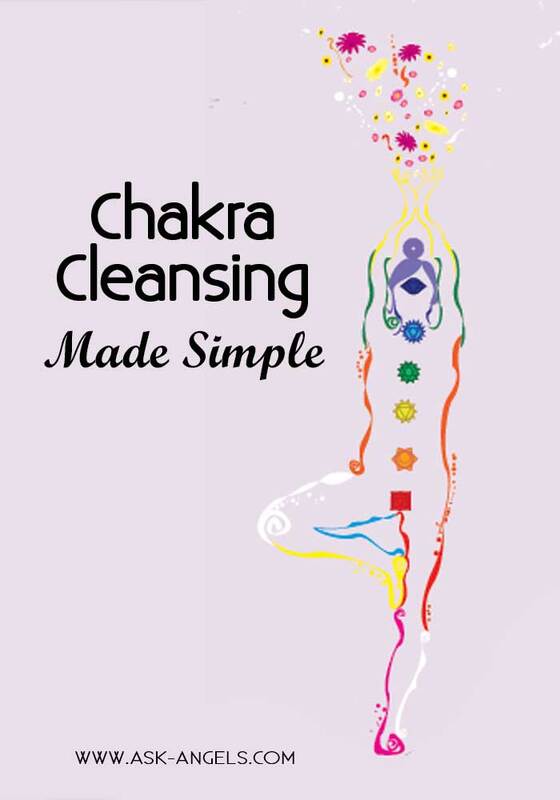 It’s relatively easy to incorporate chakra cleansing into your nightly or weekly routine. You can cleanse to alleviate a specific problem or for general well-being. I try to cleanse at least once per week and more frequently if I notice changes in my energy levels and emotions. If you are able to practice every day, you’ll soon notice positive physical and energetic changes. There are several methods you can follow to cleanse your chakras, but I have a few favorite meditations that I find to be easy, quick, and very effective. I encourage you to adapt these mediations to your own needs. It’s important that you follow your intuition and learn to trust that you know what you need. Begin in any meditative posture. This includes sitting cross-legged, sitting in a chair, standing, or lying down. Take slow deep breaths without forcing. Breath is a natural healing tool that we have but unfortunately many of us breathe rapidly and shallowly. A few minutes at a slow and steady pace will begin to oxygenate the body and prepare you for the practice. Inhale through your nose, exhale through your mouth. Do a quick body scan to assess where you are holding tension. You can do this by shifting your awareness over all your body parts, or begin at your toes, squeezing and relaxing your muscles a few times to invite the release of tension. Envision a ball of white light above your head. This light represents your connection to the Divine. After some time, allow the light to flow down to the crown of your head, resting on your seventh chakra. Allow yourself to feel safe and protected and be fully present with this downward flow. Then envision the light flowing down to your third eye chakra. When you are ready, repeat the inhalation and exhalation along with the mantra. Continue to envision the light flowing downward, stopping at each chakra. When you finish, envision the light covering your entire body, down to your feet. Next envision the released energy gathering into a ball of light in front of you. When all the negative and stagnant energy is gathered, envision the ball rising upward into the heavens to be transformed into universal energy. To close the practice, say a prayer of your choosing or express gratitude for the cleansing. Acknowledge the abundance in your life. Take slow deep breaths without forcing. A few minutes at a slow and steady pace will begin to oxygenate the body and prepare you for the practice. Inhale through your nose, exhale through your mouth. Begin at the root chakra and imagine it as a spinning sphere of red light. Picture this energy pulsing and expanding, spinning faster. Imagine the red light becoming stronger. Spend one minute doing this for each chakra, using the corresponding color for each chakra. Next envision a ball of white light above your head. This light is to represent your connection to the Divine. Envision this white light flooding downward through all your chakras at once. Imagine a running tap or a waterfall of energy running through each chakra, flooding them. Imagine that any stuck energy is being washed out through your feet. Slowly, allow the white light to cleanse and replace the colored light of each chakra until you are left with nothing but pure white light pulsing and spinning strongly through each chakra. Allow your intuition to tell you when each chakra is cleansed and when the flow of white light can stop. It can take five, ten, 20, or more minutes. Stay with the meditation as long as it feels right for you. At this point, your chakras are wide open. Adjust each chakra to a flow, spin, or radiation that feels comfortable for you. Similar to adjusting a dial, only the goal is also to adjust all the chakras so that they spin in harmony with each other. Allow your intuition guide you toward what setting feels right. On days that you don’t do this practice, try to make time for other grounding and opening activities. Like eating lunch in the park while sitting on the ground, walking barefoot in the grass, taking a nature walk, or just sitting in the sun for a few minutes. There are so many things your angels can support you with, including cleansing your chakras. Click here to Learn How to Cleanse Your Chakras With Help From Archangel Metatron! I’ve also channeled a powerful chakra cleansing meditation with Archangel Uriel you can access free here, or as a YouTube video below! The 7 Chakra system is only the start for those who are ascending. 20 Methods For Sacral Chakra Healing! Thank you for your love Melanie. Be blessed. Heartful Gratitude and love for being with me.